Church Leaders In Philippines Condemn Bloody War On Drugs : The Two-Way Manila's cardinal and another senior cleric have harshly criticized what human rights groups call extrajudicial killings that have claimed more than 5,000 lives in the past 14 months. 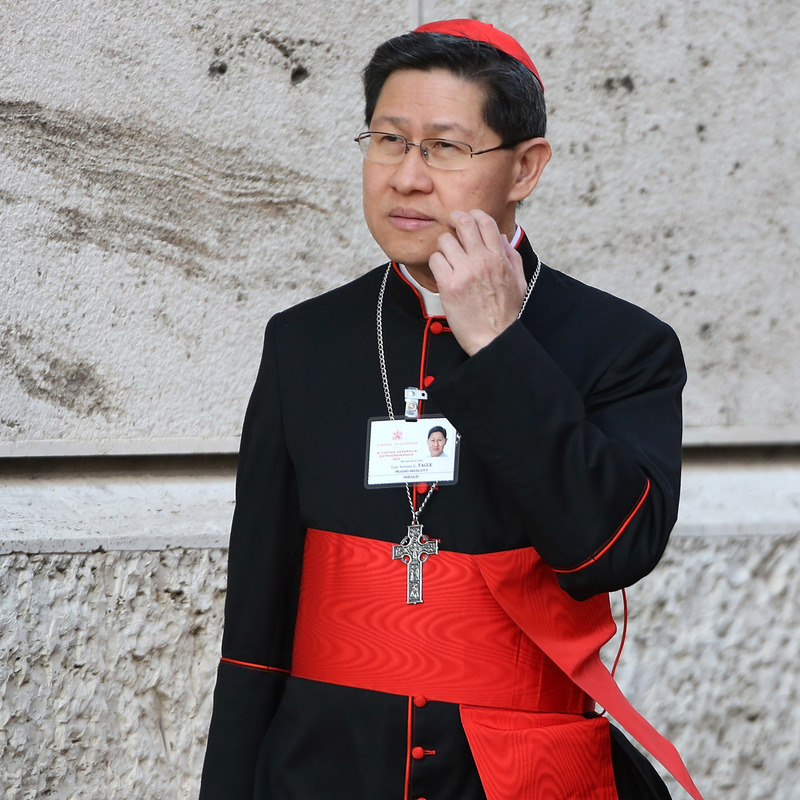 Manila Archbishop Cardinal Luis Antonio Tagle arrives at the Synod Hall on Oct. 8, 2014, in Vatican City, Vatican. Tagle has called for an end to the bloody war on drugs in the Philippines. The head of the Catholic Church in the Philippines has harshly criticized a government campaign of alleged extrajudicial killings of drug suspects that has claimed thousands of lives, calling it a "humanitarian concern" that cannot be ignored. Police have killed an estimated 3,200 people in the past 14 months in encounters they claim involved suspects who put up armed resistance. Another 2,000 have died in drug-related killings – in many cases carried out by motorcycle-riding masked gunmen who human rights groups say are either police in disguise or their hired hit men. In a single day last week, police in the Philippines killed a record 32 people in drug raids, according to Reuters. "We knock on the consciences of those who kill even the helpless, especially those who cover their faces, to stop wasting human lives," Manila Cardinal Luis Tagle said. "The illegal drug problem should not be reduced to a political or criminal issue. It is a humanitarian concern that affects all of us." Tagle was supported by Archbishop Socrates Villegas, who said Sunday that church bells would ring every night for the next three months to spark greater awareness of President Rodrigo Duterte's crackdown. "The sounding of the bells is a call to stop approval of the killings," Villegas said in a statement read Sunday in churches in his district in Pangasinan province, according to The Associated Press. "The country is in chaos. The officer who kills is rewarded and the slain get the blame. The corpses could no longer defend themselves from accusations that they 'fought back.'" The Church was initially silent about the anti-drug campaign, but has in recent months stepped up calls for its end. Duterte's campaign, which has drawn international criticism, has gotten high marks from President Trump, who in a leaked transcript of a phone call praised the Philippine leader for an "unbelievable job on the drug problem." Duterte has compared his crackdown in the Philippines to the Holocaust, saying he'd like to deal with drug addicts the way that Nazi Germany dealt with the Jews.